Back to school time is a great time for RV tailgate shopping and preparing your rig for another year. Hope springs eternal for alumni and new students alike, as we hope to be celebrating in Tampa on January 9. Everyone is excited about the new school year or in our case, the new football season. As we countdown to kickoff, we’ve got a lot of prep work to do on our tailgates and RVs. 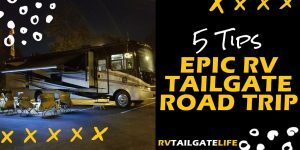 Here are 5 reasons why the back to school time is a great time to prepare for the RV tailgating season. Do you remember living with one or more roommates is a space no bigger than an RV? It was the time of your life and part of the reason you come back to tailgate now. Of course, you had a maintenance guy you could call when the toilet wasn’t working. Dorm life consisted of minimal private space, small storage options, and creative organization hacks to live your life in 225 square feet. Now you have about 350 square feet, but that also includes your bathroom, kitchen, and driver’s cab. In other words, we are looking at roughly the same amount of space. At least now, you don’t have to worry about Resident Advisors kicking out your significant other (now spouse) or friends. In such a small area, organization and cleanliness become high priority items for surviving even a short period of time. Closet organizers, over the door hooks, bedside caddies, plastic storage bins, and StickOnPods are all recommended dorm room organizers. And if you have searched our Pinterest profile, you’ll see many of the same suggestions for RVs. Schools often have rules about nailing things into the wall, just like RVers are generally discouraged – the solution for both is Command Hooks. Today’s dorm room will also have all the latest in electronics – laptops and tablets, TVs, sound systems, iPods, wifi, fridges, microwaves, and cell phones. In many ways, we all are looking for the same thing – small, powerful electronics on a budget. One item that will be new to my RV this year is a small wireless all-in-one printer so now I’ll never have to worry about leaving that parking pass at home. Since it is wireless, I can print the pass or electronic tickets directly from my phone or tablet. And for the coffee drinkers out there, don’t forget about single serve coffee makers . Just because the space is small does not mean you can’t be stylin’ at the same time. Find a great comforter to cover your RV bed. Blackout curtains provide style inside, keep the heat and cold outside, and usually provide some noise dampening benefits too. Wall decals can provide decorating flair, without adding bulk; many are temporary in case you change your mind later. Amazon and Walmart will both have back-to-school promos starting soon and you can stock your RV with all the Command Hooks you can stand. Back to school shopping corresponds nicely with the new football season. All the new freshmen going off to school need appropriate school mascot gear, and parents and friends are likely in a buying mood. Many stores target these newest customers with big discounts and you can benefit. It’s easy to catch deals, particularly if you live near your alma mater, on team gear. Step in and stock up on t-shirts, blankets, tailgate chairs, Tervis cups, and other gear for your favorite team. 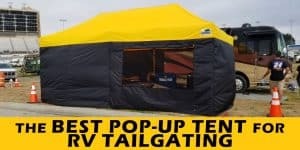 I found my tailgating tent at a back-to-school sale a couple of years ago. It’s been one of the best purchases, after the RV of course, for tailgating. Even better that it was on sale. Sure, you may not have any school-age kids in the house, but that does not mean you cannot take advantage of the upcoming sales tax holidays. Since sales tax is a state tax, the specifics will vary by state. 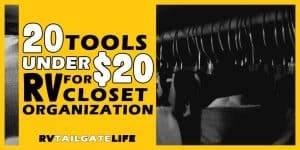 Here in Georgia, it’s July 30 and July 31 and applies to clothing and footwear up to $100 per item. Certain computers and computer accessories are also covered. Kelly Phillips Erb at Forbes has a nice roundup of the 2016 sales tax holidays. Check the requirements in your state to see how you can take advantage of the holiday. Also, look for other sales tax holidays for energy-efficient, water-efficient and hurricane preparedness products. Dehumidifiers, fans, refrigerators and light bulbs are all common RV products that qualify for the energy-efficient sales tax holiday. Sink faucets, toilets, and dishwashers may be exempt in water-efficient jurisdictions. In hurricane-prone states, you may be able to pick up such gear as generators, power cables, batteries, tarps, cell phone chargers, flashlights, weather radios, and smoke or carbon monoxide detectors without paying sales tax. These alternative sales tax holidays vary throughout the year, so be sure to check with your local state officials (or at least the local media, who are sure to talk about them as they approach). If you already have to take the kiddos in to see the doctor, why not check your own vaccines to make sure they are up-to-date? Nothing worse than a flu bug hitting you during rivalry week, keeping you from enjoying the tailgate and game. We also recommend a tetanus booster, if you have not had one in awhile. Many tailgates are held in parking lots and fields where a rusty nail can poke through your shoes. Early on in my tailgating career, I stepped on a nail in a lot that we had been tailgating in for years. It didn’t stop the tailgate, but I did have to get a tetanus booster the next week. All this talk about vaccines and rusty nails reminds me that you need a basic first aid kit in the RV. Most universities have a fiscal year that runs July 1 – June 30. This means that all those fundraising campaigns just turned over and they will be hitting you up again for more money. Avoid phone calls and emails from your alumni association by giving early in the fiscal year. Also, many alumni associations will give you extra benefits for donating, some which could be quite useful during football season. These benefits could include special deals on team gear, access to homecoming activities, and even priority for bowl game tickets.